Tonight is this year's only Blue Moon. I don't know about where you live, but on Ocracoke the sky was crystal clear last night and the nearly full moon shone down on the village, blanketing us all with its warm, comforting glow. Soft shadows fell from the cedars and live oaks as I walked home from visiting cousin Blanche. The lane was quiet, and my bare feet fell silently on the cool sand. It was good to feel at home. Look for the Blue Moon tonight. You can read more about it here. PS: Lou Ann arrives tomorrow! Look for her at the Friday night pot luck, and on Saturday during the Festival. It will be so nice to have her back on the island. "My family & I were starting our summer vacation(s) this weekend staying at the nps campground. My daughter`s boyfriend & another young fellow that came with us got up early Sunday for some fishing and while heading down to the bait shop.....they saw a bear run across the road from the beach side toward the sound. "They were not sure at first what it was, but being from the western side of Chesapeake Va. we occasionally see one that has been flushed out of the woods because of some new housing development. [We were told that] there are no bears on the island, that it must have been a large rat! It was no rat. Anyway, anyone else seen it? Because it was a bear." Well, I know we've had bears on the island before. It is certainly not common, though. Some of our readers may remember hearing stories several years ago about a bear that swam over to the island and was seen by a number of boaters and other folks. I'm even told it tried to climb into one unfortunate fellow's skiff! Just about a year ago a visitor alerted me to a bear carcass that she found on a remote section of our soundside beach. Sure enough, there it was. I remember many times my father telling me that his father told of a traveling entertainer who came to Ocracoke more than a hundred years ago with a trained bear. He must have made quite an impression on islanders! I was relating the latest story to friends when I discovered that one of our park rangers has seen this recent ursine visitor. Apparently the rangers have posted notices around the island so residents and visitors will be on the lookout. If you see the bear stay out of his way. I'll bet he's hungry. And send us your story. We'll keep you updated. Late Sunday afternoon, about 6 o'clock, islanders were alarmed to hear sirens wailing. I had just come off the beach when I saw first the deputy's vehicle, next Park Service trucks, then the EMS pickup come screaming down Highway 12 with blue lights flashing. The Park Rangers stopped to pick up the lifeguards (they had just gotten off duty), then rushed up the beach. I could only think the worst. Sadly, my fears were confirmed. Somewhere north of the campground a swimmer had been swept out to sea and drowned. I had noticed rip currents forming. The lifeguards had even posted a sign near their stand to keep people safer. Unfortunately, rip currents can be deadly. And people (especially those not familiar with ocean swimming) often underestemate the power of the surf. Rip currents, in particular, can overpower even the strongest swimmer in an instant. Please enjoy our beaches. They are among the best, cleanest, and most beautiful in the country. But learn how to recognize rip currents and how to escape from them (they are narrow and powerful, but swimming parallel with the beach will let you get out of their grip). And remember, the National Park Service provides lifeguards at the beach just north of the airstrip. Don't hesitate to use that beach. Our sincere condolences to family and friends of the young man who lost his life on Ocracoke over the weekend. Saturday's fund raiser for the Ocracoke Volunteer Fire Department was a huge success. The pig pickin', auction, and dance drew a large, happy, and generous crowd. Barbeque was sold out soon after 6 pm. By 7 o'clock the Community Center was full as everyone filed in to bid on items donated by local businesses, artists, and craftspeople. Surfboards, bicycles, power saws, bird carvings, jewelry, t-shirts, and many more itmes were sold to the highest bidders. Together, the live and silent auctions raised $15,000.00. Soon after 8:30 the last "Sold" was called out. By 9 o'clock the dance floor was filling up as the "Ocracoke Rockers" began playing. Later that evening the "Dune Dogs" from Raleigh added their contribution. The Ocracoke Fire Department has recently launched an ambitious project to upgrade and improve their facilities, and to purchase new vehicles and equipment. Donations are always welcome. Checks may be made to the Ocracoke Fire Protection Association, and mailed to PO Box 332, Ocracoke, NC, 27960. We thank all of our friends, both on island and off island, for your continued support of our island services. Happy Memorial Day Weekend to all of our readers! There are a bunch of people on the island, and the weather is just about perfect (cloudless skies and temps in the mid-70s), but we're not too busy (at least not yet). I think most folks have decided to head to the beach (can't blame them for that). This evening the Ocracoke Fire Department will be hosting a big community event -- Pig Picking, Auction, and Dance. If you are on the island be sure to come out and support the Ocracoke Fire Protection Association. There is sure to be a good time for everyone. It's that time again. We've just published our most recent Ocracoke Newsletter. This month I reprint a 1951 newspaper article about a trip to Ocracoke before ferries and before the state paved the roads. The article documents the wonderful adventure of crossing Pamlico Sound on the mailboat "Aleta." Take a journey back in time with us and capture some of the thrill of visiting a place like none other in the world. You can read the newsletter here. If any of our long-time visitors have stories about trips on the Aleta, we'd love to hear them. Just leave a comment, or send us an email. The North Carolina Ferry Division has made some changes to the summer Swan Quarter and Cedar Island ferry schedules. Beginning today and lasting through the Labor Day weekend there will be four departures from both Swan Quarter on Mainland Hyde County and Ocracoke Island versus the two departures that are in effect the remainder of the year. This year one extra ferry, which would nornally be assigned to the Cedar Island route, will be be assigned to the Swan Quarter route. Travelers are encouraged to call the NC Ferry Division for up-to-date schedules and for reservations. More information is available at http://www.ncferry.org/. This month's newsletter discusses the planned replacement of the seven bridges on Ocracoke Island in early 2008, and explains some of the issues we will face. You can read it here. It has been so much fun having my son and some of his family on the island for a few days. Zoe is eleven years old and she has been helping me at Village Craftsmen. In less than an hour I was able to teach her how to "count back change." (How many college students can do that?) She has also been helping out by wrapping pottery, running errands, and sweeping the porch. I'll miss her when she goes back to the mountains. As a special treat, Zoe and Lachlan and I biked down to Springer's Point and walked the trail out to the sound shore. We met Len, the caretaker, and two folks from the Coastal Land Trust. Lachlan and I trudged through the underbrush and marsh and briars to show them the grave of Daniel Tolson (Zoe stayed behind because she was not wearing long pants). After we got back Lachlan and Zoe explored the beach and built a small sand castle. In too short a time we headed back home for lunch. 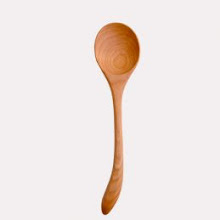 Tonight we're all going out for a pot luck dinner with friends. Not only are Stefen, Snee, & Zoe here -- a major reason to celebrate. But today is also Amy's birthday. Happy Birthday, Amy! It's so wonderful to have you living next door (by the way, can I borrow a cup of sugar?). Robert Howard. Born 1845; Died 1878. Buried on Howard Street, across from the Village Craftsmen. But why are there two markers, side by side, for the same Robert Howard? Edgar Howard. Born 1904; Died 1990. A banjo, and the inscription, "You Ain't Heard Nothing Yet!" on his tombstone. Who was this musician? Did he really play vaudeville with Gene Autry & Al Jolson years ago? Agnes Scott Garrish. Born 1898; Died 1919. Was she related to the namesake for Agnes Scott College in Georgia, and how did she come to be buried on Ocracoke? Join cousin Blanche and me at the Ocrafolk Festival on Saturday, June 02 at 11:45 am on the Howard Street Stage for talk about these folks and other fascinating stories of Ocracoke Island and our many family cemeteries. The sun is shining. The temperature is in the mid to upper 70s. It is a wonderful day. And I've finished several outstanding projects. I just installed a new, on-demand water heater at Village Craftsmen (it wasn't too hard to hook up, and it provides unlimited hot water), unclogged a stopped drain (the new, improved Liquid Plumber works like a charm), and I (with the help of Juana) did a thorough cleaning of my gypsy wagon. It feels good to strike things off a list! But the best news is that my son, Stefen; his wife, Snee; and their oldest daughter, Zoe, will be on the island sometime this afternoon. They can only stay a couple of days (the whole family will be back in July), but it will be good to see them. We couldn't have ordered more perfect weather. A couple of days ago a colorful character poked his head through the doorway, gave me a sinister look, and challenged me to a duel. Then he laughed heartily and gave me a bear hug. It was Bones the Pirate. Bones lived on the island several years ago. Some of our readers will remember him. Sporting a thick beard, skull and crossbone earrings, a long ponytail, and a pirate costume, he sold t-shirts and entertained young and old alike at the Community Store Square. Ocracoke is delighted to have Dr. John Moore back at the clinic. John had served the island several years ago, but left to work on the mainland. In the meanwhile Ocracoke has been served well by Matt, our Physician's Assistant. However, Matt was not able to be here on the island every week. On Matt's "off weeks" residents were sent to Hatteras for medical care. I understand that John and Matt will be alternating weeks at the clinic. The wound is healing well. I suppose it's only a matter of time before any little boy ends up with a major cut, scrape, or break. Thanks to all those at our clinic who serve residents and visitors year 'round! A gentle, rejuvenating rain fell on Ocracoke overnight. Along with the rain came cloudy, overcast skies and cooler temperatures. For the past several weeks I have noticed all of the new growth -- fresh, yellow-green leaves sprouting on live oaks and yaupons, copious blankets of clover in yards, new buds here and there, and ripening peaches on the ends of once bare branches. With the rain will come more growth and the beginning of a summer filled with music, and friends, and boating, and business, and beach. The cycle of life continues, and it's good to be a part of it. A couple of days ago I was walking down an island path with Lachlan when we spotted a large, heavy bodied snake about three feet long, maybe longer. He (or she) was already half concealed by a conglomeration of dead branches, vines, and leaves. As we approached, the snake began to slither further under cover and eventually disappeared. We never did see the snake's head, but it's body was dark with thin amber bands about an inch or two apart. I am not a herpetologist, but after some searching I have determined that this was a Northern Water Snake (Nerodia sipedon), or more likely, a subspecies, the Carolina Water Snake. According to the Davidson College web site, this snake "inhabits brackish water, salt marshes, and fresh water along the Outer Banks." Although not poisonous (common knowledge suggests that there are no poisonous snakes on Ocracoke Island), this snake will bite when handled (we were not tempted). I left the island yesterday morning for Nags Head. That's where my dentist is located. After a thorough cleaning and checkup I was happy to hear that everything was just fine. No cavities. Not even any suspicious looking areas. Just continue what I've been doing -- brushing and flossing regularly -- I was told. I got back home earlier than I'd expected (even after running a couple of errands), so I took my walk on the beach. I hadn't been out to the beach for several days. I'd heard that a container of ceiling fans had tumbled off of a ship and broken open. The Styrofoam packing material broke apart and was scattered along Outer Banks beaches. I'd been told that quite a lot of Styrofoam was littering our beaches. On the ferry ranger Kenny Ballance assured me that workers had been sent to the coast, including Ocracoke, to pick up the debris. Fishermen and other beachgoers have helped too. By the time I took my walk yesterday afternoon the beach was clean. No Styrofoam to be seen. Too bad ceiling fans don't float. We're told that some mainland companies have initiated "Casual Fridays" when employees can dispense with neckties and business outfits, and are allowed to come to work in open collared shirts, khakis, and flat soled shoes. On Ocracoke we have Casual Fridays, and Saturdays, and Sundays, and Mondays, and Tuesdays, and Wednesdays, and Thursdays. Just about every old island home had a shell pile. 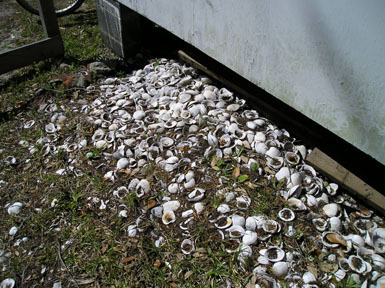 Out back by the shed, or in the side yard, the pile of clam shells grew year by year. Often there was a fish cleaning table nearby. Fish heads and such were buried in the garden. The ubiquitous island cats made short work of the remaining discards. However, when it came time to open clams most of the shells were tossed to the side. Some were spread at the bases of fig trees. Others were put in the soft sand lanes. Over time the roads were hardened and fewer and fewer automobile drivers found themselves stuck in the sand. Nevertheless the shells in the yard accumulated. Some of the old deeds even identified property corners as where "so and so had his shell pile." Thankfully, the tradition continues. Here are photos of two shell piles, the first about thirty years old; the second much more recent. A note about this month's newsletter: Astute reader, Warner Passanisi, pointed out that the link on the last several postings is inaccurate. I have made the changes and the link now works properly. I had wondered why we had not received any comments or questions about the bridge replacements scheduled for the first two and one half months of 2008. If you are thinking about making a trip to Ocracoke in early 2008 please read the newsletter carefully. You will need to use the Swan Quarter or Cedar Island ferries, or have a vehicle capable of driving on the beach. You can read the newsletter here. "Where are the clam rakes?" Al yelled early one morning not long ago. I was still in bed, awake, but not quite ready to get up. The windows were open and a very gentle breeze was wafting across the room. "They're propped up against the out building," I called back. "Oh, no they're not. I put them inside the shed," I corrected myself. I could hear Al grumble and fuss out in the yard, but I knew it was just a show. I have five rakes. The clam rakes technically belong to me, but in reality they have become communal property. Other friends have one or two, so whenever anyone needs more we simply borrow from each other. Al had friends visiting so he was preparing to take them out in the sound to do some clamming. I hadn't been yet, and secretly wished I was going also. But, truth be told, my day was already planned. I really didn't have time to go rake for clams. Almost as good, however, when Al returned the rakes he brought with him a bucket of fresh clams. As O'cockers say, they were good some! I'm told that there are housing developments where residents are forbidden to hang laundry out to dry. I've never lived in such a place, and I've never actually seen the written agreements, but I believe they exist. And I can't understand why. Hanging clothes on a line saves money and energy. Laundry hanging out to dry is also a sure sign that real people live in a community. Furthermore, while you're out in the yard with clothes basket and pins at your side a neighbor might chance to stroll by. There's a fine opportunity to share news, find out what is going on in the neighborhood, or simply to smile and wave hello. At least that's the way it is here. I'm happy to live where I can hang out my laundry. Yesterday I was out in the side yard chatting with my daughter, Amy. Lachlan was running up and down the ramp at their house. As we talked, Michael skidded to an abrupt stop behind us, nearly touching Amy's calf with his bike tire. We both jumped. As usual, Michael had an infectious grin on his face. He was just being impish. Michael is co-owner of the Flying Melon Restaurant where Amy sometimes works, and he was riding down Howard Street when he decided to stop and visit. We stood there talking for a while, but I was in the middle of a small plumbing project, so I excused myself to get back to work. As I walked away I thought, this is one of the reasons that life on the island is so pleasant. We all work. But in unconventional ways, and sometimes at odd schedules. And usually we are flexible, so we can stop and chat with neighbors along the lane. I believe the relaxed pace of life is a healthy way to live. It encourages creativity, and neighborliness, and a lighthearted approach to daily living. It suits us just fine. Islands, the magazine, that is. Their latest issue (June, 2007) features a story on Ocracoke, starting on page 62. Author Ken McAlpine has been to the island several times, and has contributed this interesting article as one of three under the heading A Seafarer's Journal. If you get the chance check it out. There are some fine photos of Ocracoke as well. Even the cover shows Ocracoke's schooner Windfall sailing toward the coastline. Unfortunately, the captions (one on page 5, and another on page 62 with a broader view of the same scene) identify the area as Teach's Hole. It is not Teach's Hole. Rob & Sundae called to talk about the misidentification. Rob says he's never been to whatever coast is shown in the magazine (in spite of the fact that his schooner is shown there). I even took the photo to Maurice Ballance (he is 80 years old and has lived on the island his entire life), and to Maurice's nephew, Gene (he has mapped every foot of Ocracoke's coastline). We all agree that this is not Teach's Hole. Gene emailed me the accompanying aerial photo of Teach's Hole and Springer's Point. I hope you enjoy this view. If you have the opportunity to see the magazine, compare both photos and you will see that they are two very different places. Springer's Point juts out into Pamlico Sound in the upper left side of this photo. Red areas indicate tree cover. Also note the white sandy beaches. The "Old Slough" is the branching tidal creek in the center of the photo just below Springer's. In addition to doing a little sleuthing, the afternoon turned into a wonderful visit with Maurice and Gene. Maurice, as usual, was barefooted. We walked together down the dirt path to Gene's house (after Maurice retrieved his "walking cane" from the back of his pickup truck). Our visit with Gene at an end, Maurice led me down another path to visit the graves of his parents, grandparents, great-grandparents, and other assorted relatives. There was even one ancient wooden marker (heart cedar, Maurice pointed out). Maurice's grandfather, Marcus (Mark) had owned 25 acres of land here Maurice remarked, gesturing wide with his outstretched arm. My visit was too soon over. I headed back home, happy to have one more opportunity to learn about my home from another one of the old-timers. We're almost back to normal (well as normal as Ocracoke ever gets). The Swan Quarter & Cedar Island ferries are running again this morning. The strong winds have abated (wind velocity is only about 10 mph today), the sun is drying out the dampness, and shop doors are reopening. Word from UPS has it that a portion of the road on Hatteras Island is still covered with sand from ocean overwash, so their truck won't be traveling to the island until tomorrow. But we understand that the DOT is working hard to open Highway 12 sometime this morning. All the while life just continues to flow here on Ocracoke. "Currently on Ocracoke: cloudy, winds from the NNE gusting 44-53 knots (courtesy N. C. Ferry Division Ocracoke). Highest wind recorded overnight was 63. There is minor flooding in areas facing the sound (high tide last hour), such as the rear of Jackson Dunes and Tom Neal Drive. Some water is seen under a few of the houses in Oyster Creek, some of which accumulated from waves crashing into bulkheads. Water levels are right at the bulkhead in much of Oyster Creek. NC 12 on Ocracoke is open with no major issues, maybe only a "trickle" across the North end. No ferries are currently running. Dare County reports sand and water on NC 12 in northern Rodanthe and road is closed, possibly into Tuesday. Luckily, there has been no known damage, no power outages, no emergency incidents, etc. "We went to the Variety Store and bought toothpaste and deodorant," they told me yesterday. "Wish we'd packed our bags. Now we'll be wearing the same clothes until the ferries start running again." These folks were some of those who came to the island yesterday for a day trip, and ended up spending the night. Maybe two nights. The wind is gusting to 40 mph or more as I write. Trees are bending in the wind, the air is sharp, and the ferries are tied securely to the docks. Locals are taking it in stride. It's one of the consequences of living on an island. Honestly, many of us like being cut off from the outside world, at least for a while. We are reminded of our special place here on the Outer Banks. Remembering Hurricane Alex three years ago, some islanders have moved their cars to higher ground. Already, Jude says, the tidewater in the creek in front of her house is just about ready to spill over into her yard. And we've heard reports that the ocean has washed over the road on Hatteras Island. Living on the Outer Banks is never dull. I awoke this morning to trees swaying outside my bedroom window. In my outdoor shower I watched as branches bent and gently touched the roof of my out building. I didn't think too much of it until I received a phone call from Jude. Apparently the weather service is calling for increased winds (maybe as high as 60-70 mph) later today & through tomorrow, with a chance of beach erosion and soundside flooding. Visitors I've spoken to are planning to leave, hoping the ferries will be running when they get to the dock. Me? I think I'll finish a few tasks I've set for myself this morning, then close up shop for the day (I've only had two customers all morning!). Then I'll put my car on a small hill and take the rest of the day off. I'll let you know tomorrow how we fared. The house is old, the ceilings low and the stairs steep. Painted on the risers are these words: "Watch Your Step. It May Be Your Last." The walls are unpainted tongue and groove pine....that is, where there are walls. The kitchen is just exposed ancient heart pine framing members. There is an old metal bed in the downstairs bedroom, and a dresser pushed up against the wall. A few simple chairs and a table or two adorn the living room. A wooden cable spool, covered with seashells, rests on the screened in porch. Across the dirt road, past the marsh grass, a lonely red light flashes languidly on a channel marker. In the distance I hear the distinctive "quawk" of a night heron. A few scattered stars peek out from an overcast sky. Inside, six friends sit around the poker table. Nearby, scribbled on the wall are the penciled accounts of the 1933 & 1944 hurricanes ("14 foot tides," "Island completely under water," ""3 feet of water pounding through this cottage, "Porch blown off and front windows shattered"). But this night is quiet. We push the windows open and prop them up with sticks lying on the sills. Only a gentle breeze rustles the cotton curtains. I get on my bike and pedal through the dark, silent village. On Lawton Lane I spy my porch light welcoming me home. I walk up my stairs, crawl into bed, and fall asleep. That's the Ocracoke Invitational Surf Fishing Tournament which kicked off Wednesday night with a gathering at Howard's Pub. This is the 24th annual tournament, and teams of anglers return year after year for some of the best surf fishing on the East Coast, as well as a rollicking good time. Sixty-six teams (including more than two dozen all female teams) compete all day Thursday and all day today. Last night the Ocracoke Rockers entertained them at Howard's Pub until midnight. This evening at 5:30 the tournament hosts a pig pickin' under the tent at the Community Center. Afterwards judges will hand out awards, then everyone heads back to the Pub for another party. You can't say these folks don't know how to have fun. But in addition to fishing and partying, the OISFT sponsors several local causes. Last year the board presented the Ocracoke school a $500.00 check for the Sigma Willis Memorial Scholarship Fund, donated $3000.00 to the Ocracoke Volunteer Fire Department, $500.00 to the Ocracoke/Hyde County Rescue Squad, and $500.00 to the Ocracoke School Booster Club. Good luck to all the fisherfolk! On and off today I've been visiting the family graveyards across the lane. There is really so much history there, much of it buried with the souls who lie under the shade of the oaks and cedars and yaupons. Nevertheless a lot of the history can be teased out by carefully reading the dates and epitaphs. Still more, the best stories and details come when I walk among the tombs with cousin Blanche. Who is buried here, with this large heavy stone as a marker? There is no inscription. I know he was a sea captain. What is his story? And what about this concrete post? Whose grave is this? And Esther O'Neal....is this the midwife everyone called Aunt Hettie Tom? I know there was no doctor. How many babies did she birth? What about these four tiny markers with inscriptions on each side? Of course, these are the graves of eight children buried side by side. What a tragedy. I wonder how they all died. How did the Braggs come to be buried in the Howard cemetery? Was it during the "time of the blowing sand?" What was that like? And is this Agnes Scott really kin to the woman who gave her name to Agnes Scott College in Georgia? And how did she wind up on Ocracoke Island? One more thing -- where was Evans Howard buried before his brother dug him up and reburied him years later, and why did he do that? Come on out to the island for the Ocrafolk Festival the first weekend in June. And stay nearby when I take the stage with Blanche on Howard Street. We'll be taking about the family graveyards and you'll hear answers to all of the questions above. In the process you'll get another glimpse into island life of generations past. As regular readers know, I prefer to shop locally. I buy almost all of my books from Leslie at Books to be Red on School Road. I almost never go off the island to do grocery shopping, preferring to trade here at home. I purchase Frank's "Andromeda Soaps" right here at Village Craftsmen. And I make lists (like nearly everyone else on the island), so that when I do go away I can stop "up the beach" as we say, and stock up on things that I can't get on the island. But every now and then I need something that I can't get locally. That's when the internet sure comes in handy. I just received a used book (published in 1957) in the mail yesterday. It cost all of 21 cents (a bit more for postage! ), but it had one section entitled The Greatest Tobacco Chewer on Ocracoke Island. I couldn't resist. And today I ordered a small tankless water heater to replace our leaking heater at Village Craftsmen. And I'm looking on line for a ceiling fan for my back porch -- one designed for damp or wet conditions. Sometimes the modern world impinges on island life, and it's not always such a bad thing. Nevertheless, we're still skeptical of many things "of the mainland." It's all a matter of balance, I guess. Yesterday a reader asked about island restaurants. The question was, "Any new restaurants opening this year and is Pony Island going to be opened for dinner? I know last year they stopped dinners." There is a new restaurant, Mango Loco, located where Sargasso Grill was last year, on NC Highway 12. I don't eat out often and have not been to Mango Loco yet (I understand though that they have the biggest selection of Caribbean food on the island). Maybe one of our readers has a comment. According to the latest advertisement in the Ocracoke Observer the Pony Island Restaurant is open for breakfast from 7 am to 2 pm. They also serve lunch from 11 am to 2 pm. My daughter, Amy, an island waitress, tells me that all of the restaurants are now open for the season. (Earlier today I posted that the Ocracoke Coffee Company has opened, but I'm told that will not be for a little while yet.) Let us know if you have recommendations.